Good parent-to-parent grief support comes straight from the heart, is voluntary and free. We maintain an active, private Facebook support group of parents who have ended wanted pregnancies for medical reasons. Here you will find friendship and understanding to help you along on your road to healing. This parent-to-parent group is “invisible” and membership is by application approval only. Your membership, your posts, and your replies in the group will not appear on your Facebook timeline. You can control what our group members may view on your Facebook profile through your own Facebook privacy settings. Please come as yourself to our group. We do not approve memberships for brand new, “empty” or inactive Facebook profiles. Yes, we can tell the difference. This is to protect our private group members. Be sure to email us from the account associated with your active Facebook profile. If you do not receive a response from us within 72 hours of applying, please check the junk folder in your email. Before applying to join, please read our Private Support Group Rules. The easiest way to apply to join is by filling out this form. 6. How you located endingawantedpregnancy.com (This just helps us determine the effectiveness of our outreach). The admin who replies to you may request that you add them temporarily as a Facebook friend—this is the fastest and most reliable way to add new members, but extending a friend request offer is at each admin’s discretion. We require that all new members make a post introducing themselves to the group shortly after gaining access. Members who do not introduce themselves will be removed. This is for the safety and security of all of our group members. Introductory posts typically receive a warm and supportive welcome. Our grief support community has run private parent-to-parent support groups on a number of platforms since the mid 1990s, from the (now defunct) Yahoo email listserv, to the Yuku board which ran from 2005-2015 (both of which you may see referenced in stories from our members), to the private Facebook group that is active today. 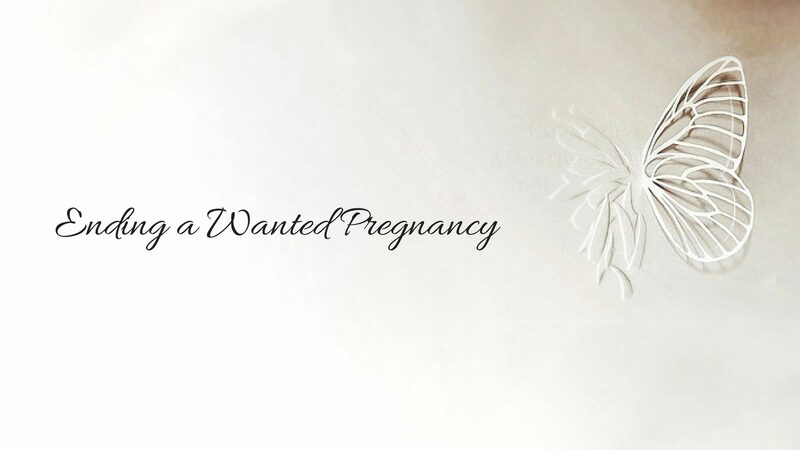 If you’re not comfortable with joining Ending a Wanted Pregnancy’s private Facebook support group, you may want to consider the Termination for Medical Reasons board at Babycenter.com. It is run by a long-time member of our grief community. It does not require Facebook. We believe that good parent-to-parent grief support comes straight from the heart, is voluntary and should be free. For your safety and security, we recommend avoiding any online grief support site or group that seeks monetary donations. Health care professionals who wish to share information about our website can download and share our printable brochure.